(Newser) – The newest amenity coming to Starbucks is a depressing one: needle disposal boxes. The company says that they will be installed at some locations because employees have found discarded bloody needles and syringes in bathrooms, USA Today reports. More than 3,750 workers have signed a petition asking for the boxes to be installed in "high-risk" bathrooms. Starbucks says it trains its employees how to deal with needles safely, Business Insider reports, but the petition claims that "employees risk getting poked, and DO get poked, even when following 'protocol' of using gloves and tongs to dispose of used needles left in bathrooms, tampon disposal boxes, and diaper changing stations." 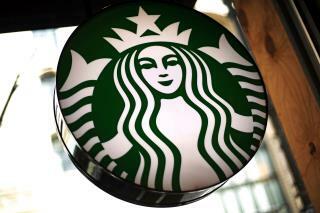 Starbucks' bathrooms are now open to the public, which some workers say has made them more prone to safety issues. Starbucks just lost a customer..."open to the public" means hey junkies come and do your business here.. Still lovin' the guys in the sweatpants, "doin' business" at the Starbucks. Yeah, right.